1.High conversion efficiencies resulting in superior power output performance. Metal surface irradiated with ultraviolet light, the photoelectric effect can occur. As Einstein explained, since the incident photon energy is greater than the binding energy of the electron, the free electrons. Solar cell function is to convert sunlight into voltage and current, a photoelectric conversion. Photovoltaic effect is much higher than the efficiency of the photovoltaic effect. Since the occurrence of the photovoltaic effect of the solar cell, the two kinds of semiconductors of opposite polarity p-n junction (p-n Junction), formed in electric field, enter the electronic drive circuit that forms a voltage and current in the circuit. "Can curl", it can be easily installed on the roof or outside irregular vehicle; "lightweight" stainless steel substrate thickness of only 0.127 mm, very thin; "low installation cost," Xun both energy photovoltaic cell production business, but also the production designer and manufacturer of the device, so the low cost of electricity. 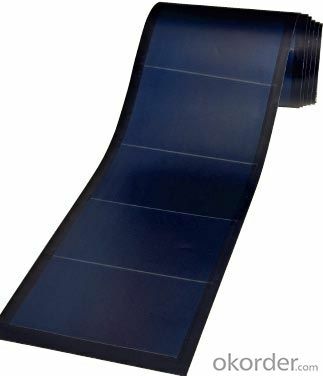 Bright sun and wind, people resting on the lawn, someone took out a curled or folded like paper solar cell module from the backpack, start to shop, even on laptops, mobile phones, digital cameras charge. This is not science fiction, but reality. 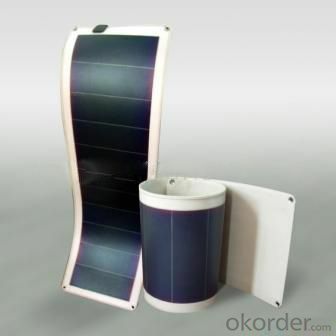 The biggest feature is the flexible thin-film solar cells can curl, can be easily installed on the roof or outside irregular vehicle; second major feature of light weight, general solar cell needs to be done to install a metal frame, or to the roof reinforcement, flexible thin-film solar stainless steel substrate thickness of the battery is only 0.127 mm, very thin; the third major feature low installation costs, energy fast force both manufacturers of photovoltaic cells, but also the production designer and manufacturer of equipment, so the low cost of power generation, considering, flexible battery is the best.